Another weekend has arrived, and with it Weekend Cat Blogging. Here we see Luna in the studio in an embarrassing state of disarray. July was a rather busy month – actually most of them are, but this one was a bit different. Between the Outsound Music Summit and all of the associated rehearsals, the various photo shoots and my new job that started last week, there hasn’t been a lot of time for much else. In particular, the studio has a victim of entropy with a lot of equipment being moved out of place for use in shows (like the keyboard and cables) or to make way for new items (the E-MU modules in the back of the picture are being moved because the space is being taken up by the new Pro Tools HD system, but I need them still to be easily accessible). And then there is the never ending torrent of paper. 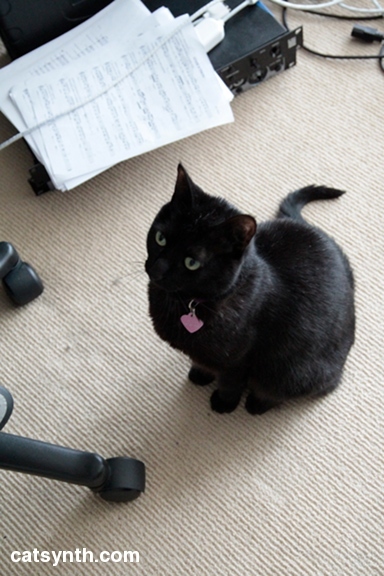 Some of it useful, like the scores from Reconnaissance Fly, the Cardew Choir and Conduct Your Own Orchestra night that can be seen behind Luna. Others, like just about any piece of paper sent by any financial institution, are mostly useless. But they accumulate as one sorts them out. The new job has also meant less time at home, and less time with Luna. I suspect she spends a fair amount of our time apart napping. It is a moment to reflect on the month that has past, and how it was a chance to focus on things that were of particular importance – my cat, music, art, city life, friends. Hopefully, after the initial change and chaos, things will be begin to come back into balance. We have also been tardy is visiting our fellow WCB participants over the past couple weeks, and will do our best to make up for that this month. As for today, we have to start cleaning up a bit. Weekend Cat Blogging #269 is hosted by Pam at Sidewalk Shoes, with a nice photo of Smudge in the yard. Carnival of the Cats #333 will be up this Sunday at One Cats Nip. The monthly Bad Kitty Cats Festival of Chaos will be at Mind of Mog. Here is the first photo of the current Reconnaissance Fly lineup, taken after our performance on KUSF today. Thanks to our host Bryan Chandler for the photo, and of course for the opportunity to play. Here is a photo I took at the start of the set. You can see the score for our opening piece “Small Chinese Gong” laid out behind the keyboard. This is one of the graphical scores that I have mentioned in a previous review. 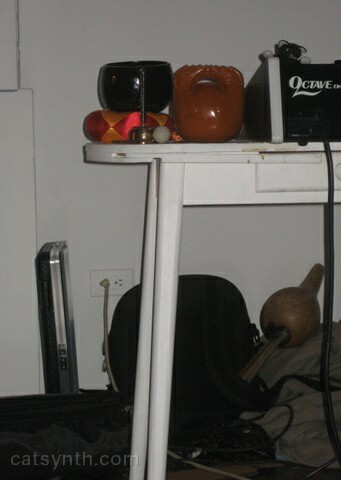 This is also the piece that fell victim to the “rebellious blue cord” that left the performance bass-less. Fortunately we were able to correct that and the rest of the set went quite smoothly. 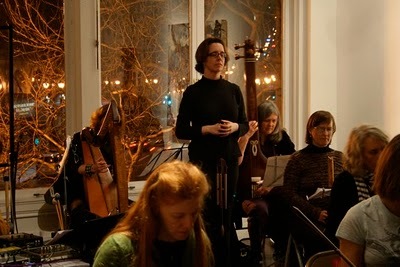 You can listen to an audio archive of the performance. I thought the later pieces, in particular “Canada”, “Ode to Steengo” and “An Empty Rectangle” came out quite well. We are definitely looking forward to our live performance tonight at Studio 1510. 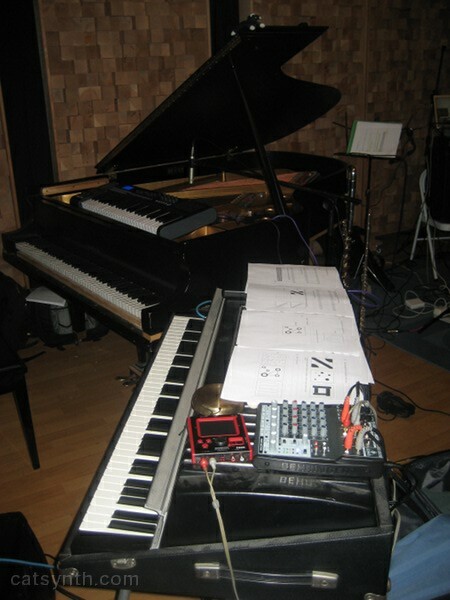 For those interested in the technological aspects: I was using my trusty Korg mini-Kaos Pad, E-MU Proteus 2000 (with Vintage Pro and Mo’Phatt), and a Voce Electric Piano module. 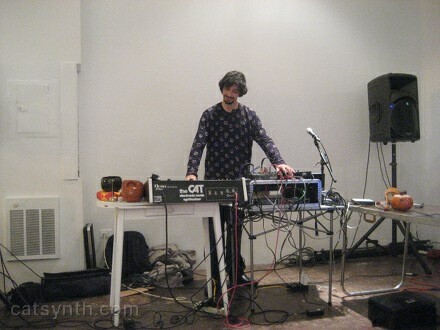 Tim Walters was also performing live custom electronics programmed in Supercollider. 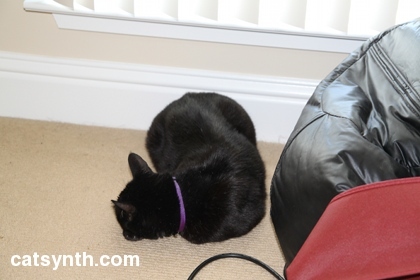 Luna is on her favorite beanbag chair in a relatively clean studio. Nearby is a crate full of old audio interfaces – it seems we have quite a few E-MU, M-Audio and Digidesign interfaces, some in various states of disrepair or obsolescence. We rely on one or another of these portable interfaces for live shows. Weekend Cat Blogging will be hosted by Pam at Sidewalk Shoes. The monthly Bad Kitty Cats Festival of Chaos will be hosted on Sunday by Samantha and The Orange Kitty at Life from a Cat’s Perspective.